The restored Dakota rechristened as 'Parashuram' will join the 'Vintage Fly' of one each of Tiger Moth and Howard raised at Hindan air force station. NEW DELHI: A restored Dakota joined the Indian Air Force today in an induction ceremony at Hindan air force station, more than four decades after the aircraft fleet was phased out following an illustrious service record. The Dakota DC-3 VP 905 was formally inducted into the IAF at a grand ceremony at Hindan where a key was received by the Chief of Air Staff Air Marshal B S Dhanoa from Air Commodore (retd) M K Chandrasekhar whose son and Rajya Sabha MP Rajeev Chandrasekhar bought and restored the aircraft. 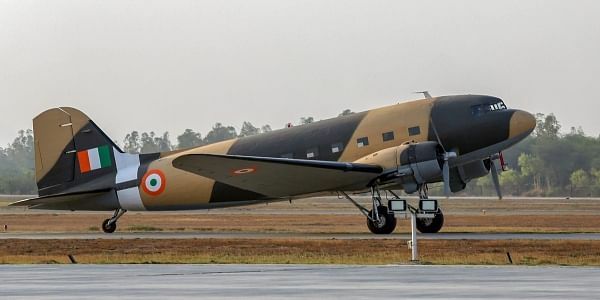 Dhanoa dubbed Dakota as a "special" aircraft in the history of the Indian Air Force and added that its "reliability and ruggedness" were proved by its journey back home from the UK where it was restored. The Dakota was accepted by the Chief of Air Staff from the Rajya Sabha MP Rajeev Chandrasekhar on February 13 this year. The aircraft was bought by the MP from "scrap" and got restored in the UK. The aircraft commenced its journey from the UK on April 17 to India with a joint crew of IAF and Reflight Airworks. It flew a total of 9,750 km during its ferry en-route halts in France, Italy, Greece, Jordan, Bahrain and Oman, and finally landed on Indian soil at air force station Jamnagar on April 25. It reached its final destination Hindan on April 26. Air Commodore(retd) MK Chandrasekhar was granted special permission by the Defence minister to fly on board the aircraft from Jamnagar to air force station Hindan. "This historic flight of the Dakota DC-3 VP 905, across seven countries, was a commemoration of the service provided by this venerable aircraft to the nation," the Air Force said in a statement. The Dakota popularly known as the Gooney Bird was the first major transport aircraft inducted in the fledgeling Indian Air Force. It was at the forefront of operations from 1947 to 1971. The aircraft played a crucial role in Kashmir operations in 1947 war and Bangladesh war. After 1971, the Dakota was replaced by Avro HS-748. The Dakotas were phased out and some of them were handed over to the BSF that used them up to 1978.